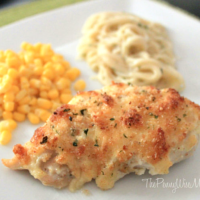 You are here: Home / Recipes / Parmesan Crusted Chicken Recipe | Fast & Easy Dinner! 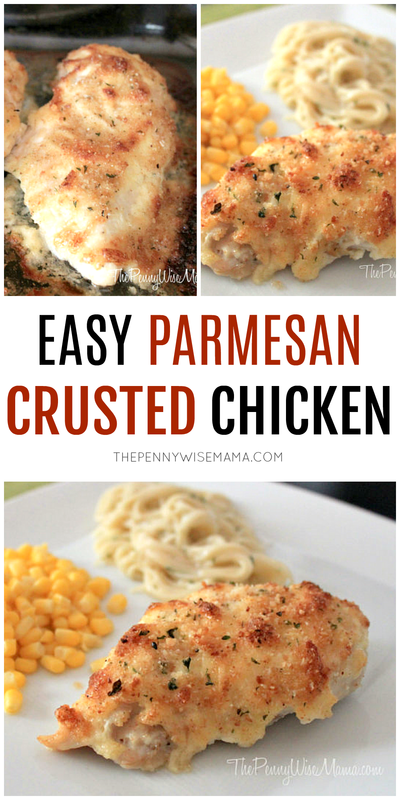 Parmesan Crusted Chicken Recipe | Fast & Easy Dinner! 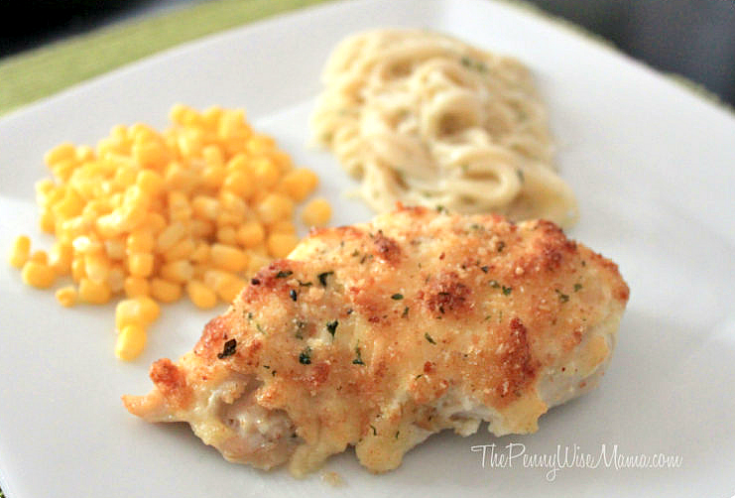 This Parmesan Crusted Chicken is so yummy and you can’t beat how fast and easy it is to prepare. It’s perfect for busy nights! Oh my goodness. I made the most delicious chicken last night. It was so yummy and so easy. It literally only took five minutes to prep and about 30 minutes to bake. It was fast and easy and that’s exactly what I need in my life! If you’re looking for something good to cook for dinner tonight, I highly recommend this recipe. The chicken comes out slightly crispy, yet incredibly moist and juicy on the inside. It only requires 4 ingredients — mayo, parmesan cheese, Italian bread crumbs, and chicken breasts. With so few ingredients, it’s one of those meals you can easily throw together last minute! To get started, heat your oven to 425 degrees. Place chicken on a baking sheet or in a glass dish (I like to use a Pyrex dish). In a medium bowl, mix the mayo and parmesan cheese. Spread the mixture evenly over the chicken breasts, and then sprinkle Italian bread crumbs over the top. Bake for 20 minutes or until the chicken is thoroughly cooked. The topping helps keep the chicken moist and juicy. It comes out a little crispy and so full of flavor! 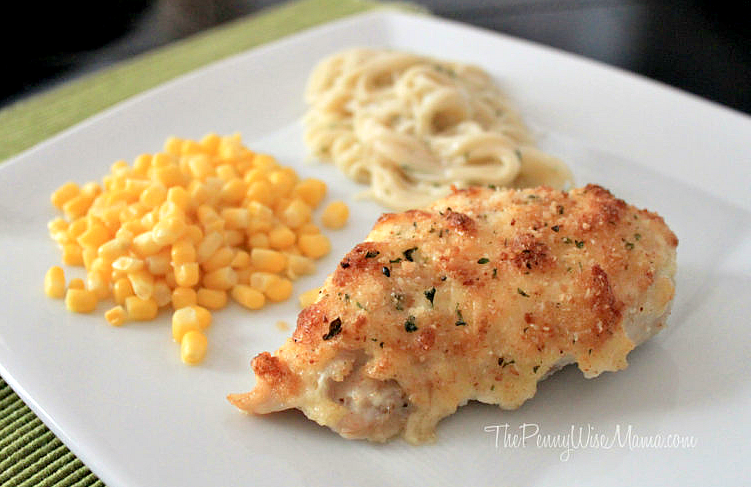 We paired our chicken with golden corn and creamy parmesan noodles. It was a huge hit among the entire family! Everyone thought it was absolutely delicious, so I will definitely be making it again! 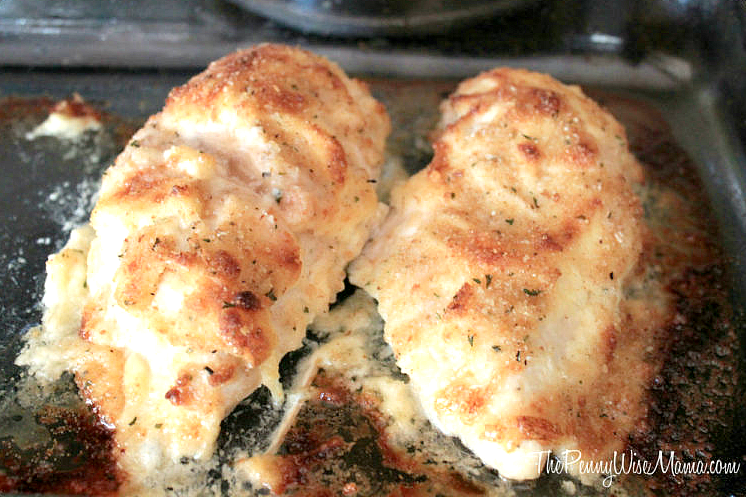 This Parmesan Crusted Chicken is so yummy and you can't beat how fast and easy it is to prepare. It's perfect for busy nights! Combine mayonnaise with parmesan cheese in medium bowl. 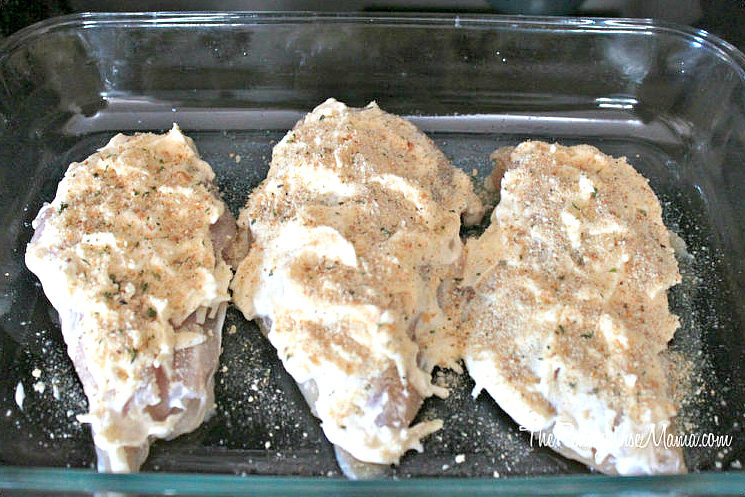 Evenly top chicken with mayonnaise mixture, then sprinkle with bread crumbs. Looking for more great chicken recipes? 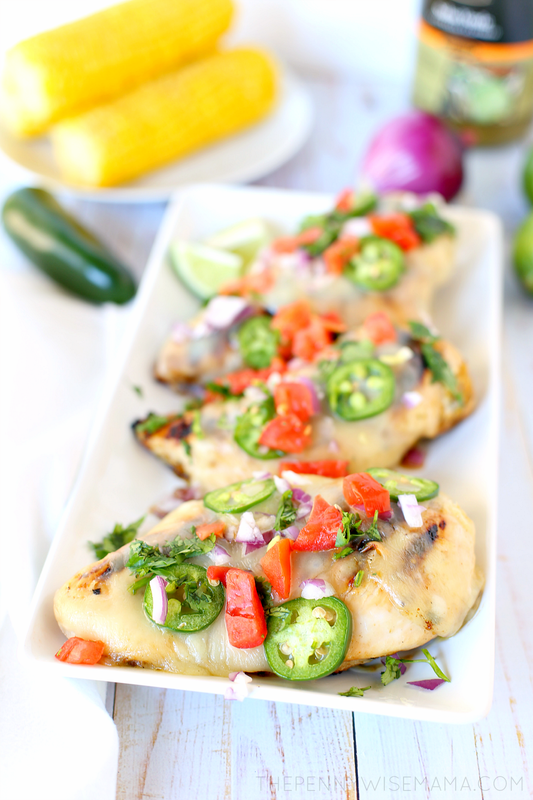 Try this Cheesy Salsa Verde Chicken! Have you tried this recipe? I’d love to hear what you think! We could all use a fast recipe…and this one looks so good. Thanks! This looks really good! We have everything on hand too. Thanks so much! That looks delicious! I’ll definitely save this! You used my two favorite words when it comes to making dinner: fast and easy! I’m happy to find any recipes that don’t take tons of prep work or ingredients I don’t have on hand. Thank you! I have made this before and it’s delicious, I love it! You wouldn’t think it would taste so good being made with mayo but wow, it’s just amazing! YUMMY!! Sounds delicious and easy to make. Thank you for the recipe! That does seem really easy and really good. Easy and quick. Love it! Oh yummmm! Why can’t my food ever come out that pretty? LOL! I’m def going to have to try this one! I have made this before and it is so yummy! Great recipe for a busy school night. yum this looks awesome!! i’ll have to try it! Oh my goodness, I love this recipe. I will be making this very soon. I might just add French’s onions to the chicken. Yummy! I’m definitely going to make this, it looks so good and really easy. Thanks! Thank you for sharing this recipe- you had me at “easy prep”! It looks delicious! This looks like such a good recipe! I’m always looking for easy, kid-pleasing chicken recipes and I think this might be one I will try soon! Thank you, I am always looking for super easy and quick recipes and this one looks great. This sounds super easy and yummy! This looks fast and tasty! I think I could adapt it to be a little healthier, too, without losing all the flavor. Thanks for posting! Just made it and amazing! Thanks a million!! This looks so delicious! Have to try it for my family one night! This looks amazing! I am pinning this now to Pinterest and will plan to make it this week! Thanks for sharing! This looks great i will try this tonight,Thanks. This is a great recipe! I put the chicken on a rack in the pan and the crispness is even better! Also I have used butter and garlic in place of the mayo… both are fantastic!! Made this tonight and it was a hit! My son is very picky (even at 9) and he LOVED! it Thank you! This chicken looks amazing! I really like how easy it is to prepare. It’s perfect for a busy weeknight meal. Thank you for sharing. I’m definitely going to give this a try! This looks and sounds fantastic.I would do light and dark meats. Hubby likes light I like dark. It would be great on both. What an easy recipe that looks so delicious. I love to try new chicken recipes. This looks and sounds like it would be very tasty. I wonder if I could use this in an instant pot. I could put the ingredients on and place it in the pot, cook for 10 minutes and then put it under the broiler for a couple of minutes. Would that work? I made this for my girlfriend and I this evevening and from start. to plate was 30 minutes. Amazing. I purchased two very large chicken breasts and when we took the first bite, both of us said wow almost simultanjiously. Paired ours with spaghetti in a three cheese Alfredo sauce and a side of salad with Italian dressing. Hi Ken, thanks for sharing. I’m so glad you liked it! I bet it was delicious with spaghetti and alfredo sauce!! Just made this for me and hubby. Sat down to eat and we both enjoyed it so so much! He just told me it was very tasty! Thank you so so much for giving me a recipe that hubby enjoyed!! 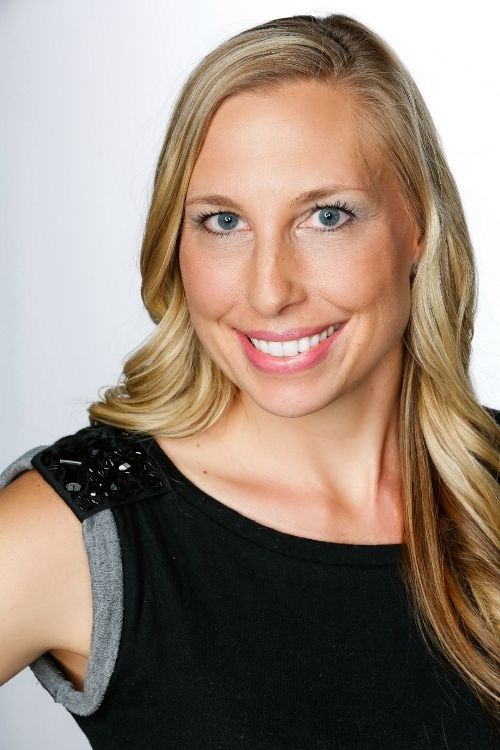 Hi Donna, thanks for sharing! I’m so happy to hear that you enjoyed it! Making tonight! If my guy thinks I went to a lot of trouble, who am I to change his view? Thanks for the super easy and simple ingredient dish. Definitely made this for dinner tonight and omg, we all loved it! Sooo delicious! Thanks for posting! Made recipe cooked for 20 min. As directed, chicken still extremely raw. Thought it was weird chicken breast cooking in 20 min. Definitely need to adjust cooking time. I’ll update review after it is done. Hi Kevin, it could take longer depending on your oven and how thick your chicken breasts are. At 425F they really shouldn’t take longer than 30 minutes. Thanks! Been making this for years! I stumbled upon your recipe and giggled cause I love pairing with the parmesan pasta too! Wal-Mart has quit carrying it (yes, I buy the pasta roni one) so I have been doing it with skillet potatoes and onions cooked with olive oil butter and seasoning…it pairs wonderful! I could eat this every night…and yep my family notices and laughs! Fantastic recipe that I have made 5 times now. It is requested often and I am happy to oblige since it is incredibly easy to make. I paired mine with Knorr Parmesan Pasta and my brown sugar and cinnamon glazed carrots. It was well received and the compliments I received were great. Thanks for sharing, Debby! I’m so glad your family likes it! I made this tonight and its so fast and easy! Its delicious! I cant stomach Mayo what can I substitute? This looks delicious. I love easy recipes like this! I’m so glad you enjoyed it! Thank you for sharing! I am not a cook , so when looking for recipes I was attracted to the simple ingredients. It turned out very delicious will be making more soon ! This was super duper yummy, and my husband loved it too. Very easy to make. We will have to again!